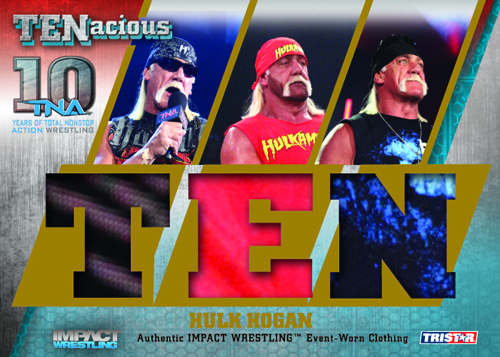 For wrestling fans, it might be hard to believe that TNA is celebrating its tenth anniversary in 2012. Rising from the ashes of WCW and marketing itself as alternative to WWE, it has been an up and down road for the company thus far. However, there's no denying the star power the company has seen over the years. 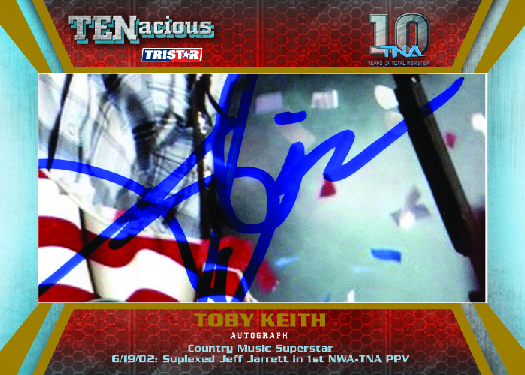 Celebrating the professional wrestling company's milestone, 2012 TriStar TNA TENacious Wrestling is another set that's loaded with autographs and low-numbered cards. Boxes of 2012 TriStar TNA TENacious are led by three autographs. All are numbered to either 100, 10 or 1. The set also has several multi-signature combinations. In honor of the anniversary, some autographs will be inscribed "TNA 10." Flashback Autographs look back at big moments and key rivalries. TriStar has also collected cut autographs for Celebrity Signature Cards for some of the many non-wrestling stars that have been a part of TNA programming over the years. Names include Chris Rock, Toby Keith, Brian Urlacher, Tito Ortiz, Dennis Rodman and Ken Shamrock. Celebrity Signature Cards are numbered to either 1 or 5. Memorabilia cards take a bit of a backseat in 2012 TriStar TNA TENacious. At most, collectors will find just one event-used memorabilia card per box. All come with a window shaped "10" or "TEN" to note the anniversary. Memorabilia cards come in different combinations to also incorporate multiple superstars and autographs. All event-worn memorabilia cards are numbered to 100 or less. The 2012 TriStar TNA TENacious base set looks at a decade of TNA action. However, building a set will take some time and, well, tenacity thanks to several short printed subsets. Jeff Hardy has created a series of special art cards. Another subset honors Sting as the first member of the TNA Hall of Fame. TNA Arrivals looks back at the debuts of top stars in the company. The final subset centers on Hulk Hogan. Short prints fall one per hobby box. All are numbered. The 2012 TriStar TNA TENacious base set is also paralleled with cards numbered to 30, 10 and 1. Two parallels are inserted in every box. 2012 TriStar TNA TENacious has a print run of 75 24-box cases. Individual boxes are numbered out of 1,800. Good: Nice colorful photos on base cards with no wasted space. Tells history of the first decade of TNA Wrestling in card format. Sketch reprint cards. Guarantee of three autographs per box. Bad: Autographs are stickers and have the same design as several past releases. Even the sticker placement is the same. 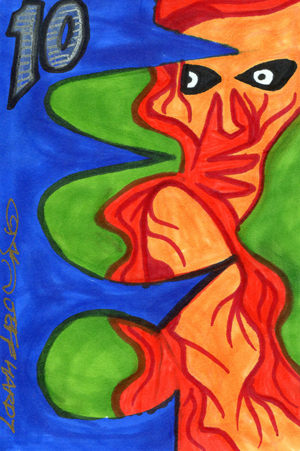 It is the same basic simple design with just different coloring in the background. Box we opened didn't get a full base set, but had several duplicates. The Bottom Line: 2012 Tristar TNA TENacious Wrestling is a mid-level wrestling product. For each box, you are guaranteed three autographs, one celebrity cut signature or memorabilia card, one short print sketch reprint card, and two parallels. This product gives collectors a chance to pull some really nice hit cards, but unfortunately we didn't pull anything spectacular in our box. The base cards are full of colorful photography with no empty spaces. I like that it showcases many significant storylines and different eras in the ten-year history of TNA Wrestling. 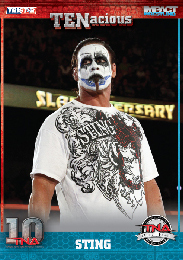 The card backs have a brief biography of the featured wrestler or writeup of the storyline. Wrestling fans will enjoy the cards of the Birth of the Main Event Mafia, TNA's 1st Heavyweight Champion, and the Top TNA matches in history. Parallel cards have a silver TNA 10 logo on the top right corner. Autographs, unfortunately, are stickers, yet again. The memorabilia cards have the three swatches cut out to spell "TEN," which is a nice touch. The 2012 Tristar TNA TENacious Wrestling checklist has 99 cards in the base set including 19 short printed sketch reprint cards. Compared to past TNA products, this release has the smallest amount of different wrestlers showcased. Because of the history of TNA being captured, several wrestlers who have been there since the beginning like A.J. Styles, James Storm, Robert Roode, and Jeff Jarrett have multiple cards. Some highlights of the Celebrity Cut Signatures that can be pulled are of Chris Rock, Toby Keith, Brian Urlacher, Tito Ortiz, Dennis Rodman, and Ken Shamrock. Each hobby box has 20 packs of six cards, which is identical to the last Tristar TNA release. Boxes guarantee three autographs, one celebrity cut signature or memorabilia card, one short print sketch reprint card, and two parallels. That is a good value for an affordable product. 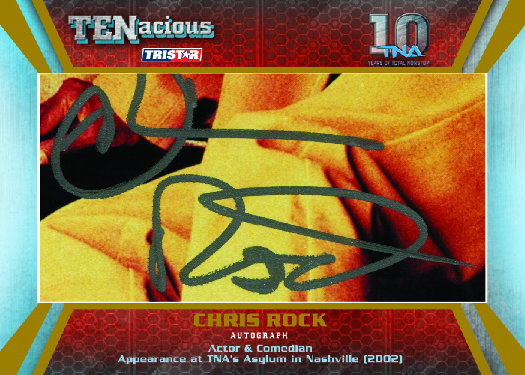 One of the main selling points of 2012 Tristar TNA TENacious Wrestling is the autographs, including Cut Celebrity Signatures. The base card designs are nice enough that collectors would be happy completing a full base set. It is relatively small compared to most other sports base sets. It would be nice if, in future Tristar TNA releases, the autographs could be on card. Many collectors are turned off by sticker autographs. One suggestion is to maybe cut the number of autographs per box from three to two if they can guarantee on-card signatures instead.